The Girl Scout Silver Award is considered the highest honor that a girl scout between the grades of six to eight can achieve, and many believes that it is truly the one and only prize every candidate dreams about. The Silver Award is also what three local teens have begun working on to achieve last month by spreading the word to raise awareness throughout the community. Along with the rest of Troop 782, local Cadette level and 8th grade Randall Middle School girl scouts Rachel Lewis, Bailey Frensley and Alanna McCullough launched their project appropriately named T.R.O.O.P. Closet, which stands for Toiletry Resources On Our Premise. 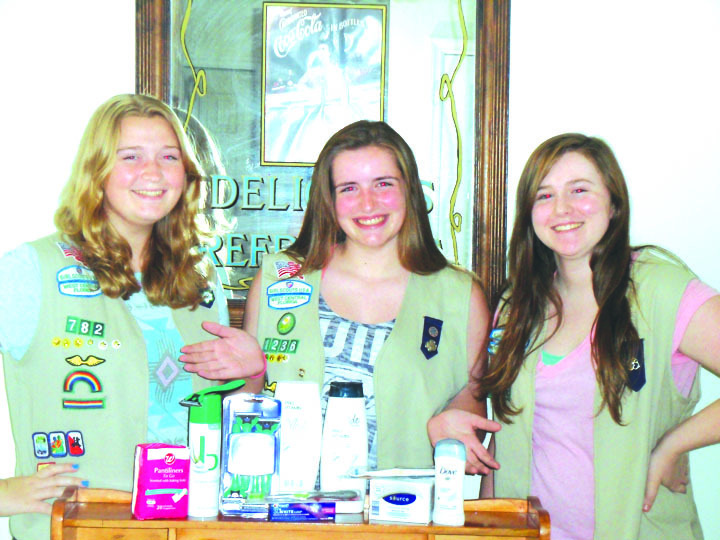 While the girls have already collected some items, their goal is to have the closets well-stocked for the start of the school year and their future hope is that the next Girl Scout troops coming through Randall Middle School will continue this resource. “We as a troop are looking for help to get the word out that we need to fill the closet with shampoos, deodorant, feminine products, tooth brushes, tooth paste and shower gels,” she said. Engaging in a Silver Award project puts a girl scout’s skills to the test as they apply proper preparation, critical thinking and problem solving, which will help them throughout the rest of their lives. Frensley and McCullough will be continuing their education at Newsome, while Lewis will be attending Blake High School. For more information and to support the project, please call Troop 782 at 684-3946.